If you have a cause that you want to support, a deck of custom playing cards is a wonderful way to get your message across. Over the years we have printed decks for local farm heroes, people trying to save the rain forest, charities of all kinds, memorial funds, and efforts for a variety veterans organizations to name a few. Sometimes the playing card decks are given away at the charity event as a personalized memento for the participants. 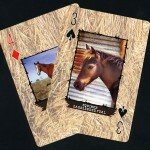 Often the personalized playing card decks are sold to raise money for the organization at the event itself. Many times there is no actual event and the card decks themselves are used as an integral part of the fundraising campaign. Some samples of the work we have done for a noteworthy non profit organization are shown above. 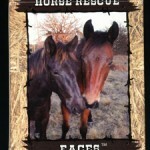 One of our favorite organizations, this “Horse themed” playing card deck benefits the Happy Horse Haven Rescue in Texas. Run by Shari Frederick – this organization has saved hundreds of horses who would have otherwise perished.Check out the face book page linked above and please contribute or adopt a horse if you are able. 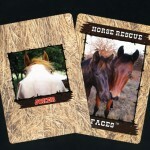 Custom card decks for fundraising are now available from our new site www.customcarddecks.com where you can build and create your own custom decks while contributing to the charity of your choice. Setting up the site with a unique landing page to collect for your charity is free and easy – just contact us to find out how.